“I knew the cards were stacked against us, but I had no idea how badly,” Finne said. 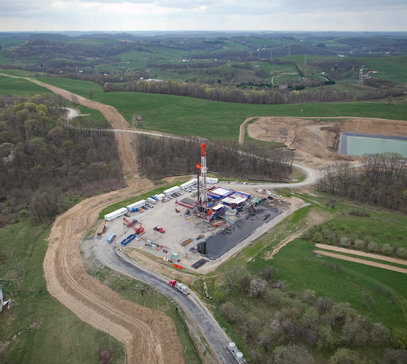 A new wave of drilling, fueled by the practice some call “fracking,” is promising prosperity and energy security for the country. E&E investigates whether anyone is ensuring it’s done right. Click here to read the report. It is a degree of self-regulation enjoyed by few other industries, if any. And it heightens suspicion among critics of the nation’s drilling boom that companies are allowed to damage the environment with impunity. “There’s still a large presumption that government is looking out for them,” Baizel said. In most of those states, industry ties are not considered a conflict of interest, or a problematic “revolving door.” Instead, they’re a job requirement. The laws creating the governing panels often require that industry be guaranteed seats on commissions, along with royalty owners, local government officials and sometimes environmentalists. Others designate that some number of the board have “substantial experience” in the industry, the environment or fields like petroleum geology. In addition to being populated from the world of petroleum companies, most of the state oil and gas agencies are expected to both police and promote the industry. As they weigh policies and enforcement, they must balance environmental protection with the need to efficiently develop a state’s natural resources (Greenwire, Nov. 30). Oil and gas agencies in some states, particularly east of the Mississippi River , are not governed by boards or commissions. Instead, they are part of a state department in a governor’s administration. In at least eight states, the head of the state oil and gas agency comes from industry. The commission also handled an outbreak of earthquakes near an injection well for drilling waste, shutting down such wells in a 1,000-square-mile area. Finne met earlier this year with the commission director, Lawrence Bengal, who explained to them that the commissioners were in charge of deciding what to do about the situation. Finne said it was after that meeting that he started to wonder about the commissioners’ backgrounds. In Colorado , penalties have risen since 2007, when the state Legislature took away the industry’s built-in majority on the state’s Oil and Gas Conservation Commission. Still, the panel’s largest fine against an active company amounted to less than two hours’ worth of profits for the company. The results of Colorado ‘s restructuring could be seen earlier this month when the executive director of the commission, Dave Neslin, negotiated with industry and environmentalists on a rule requiring public disclosure of hydraulic fracturing chemicals, Earthwork’s Baizel said. For example, in Arkansas , there are five members who own oil and gas production companies, though the law requires three. In Colorado , the small-town mayor who represents local government on the commission also used to work as a welder and fabricator for oil field equipment and trucks. In Ohio , Robert Chase, a Marietta College petroleum engineering professor, was appointed to the Ohio Oil and Gas Commission in 2008 by Gov. Ted Strickland (D) as a representative of the public. But Chase has an extensive industry background that includes working for Halliburton and Gulf Research and Development Co., and consulting for Columbia Gas, EQT (formerly Equitable Resources) and Cabot Oil & Gas Corp. But with the increasing prominence of the issue many refer to as “fracking” and the surge in production across the country, he said, the ties between industry and regulators are likely to draw more scrutiny and possibly demands for change. This entry was posted in Education / Information, News / Media. Bookmark the permalink.